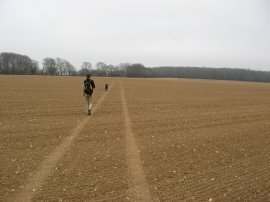 Myself and Anne did this walk on 17th March 2010, the day after completing the previous stage. 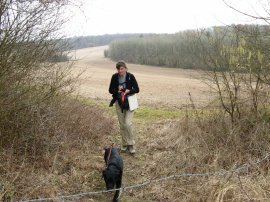 We were able to park on the route of the Wayfarers Way at Cheriton where we had finished the last walk. Setting off from Cheriton, photo 1, we followed the B3046 as it headed round to the left at the end of the village before turning to the left up a footpath that heads back past some houses before joining a track on the right which takes the route out of the village. 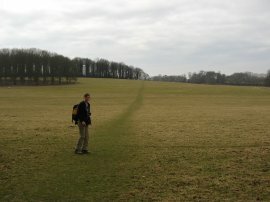 The path heads uphill, running alongside a couple of small fields to reach a larger field where the route turns to the right along the field edge to soon reach a track, Upper Lamborough Lane, photo 2. 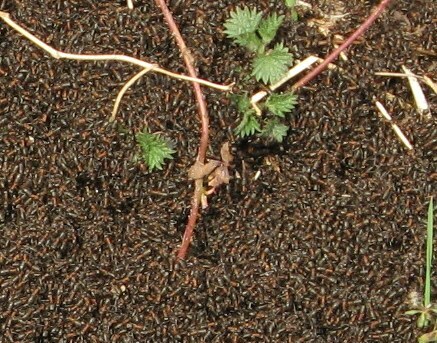 The route follows this to the left along the top of a ridge from where there were good views across to the left. The path continues ahead over another lane, which carries the Itchen Way, before turning to the right where the lane ends down another track, Broad Lane. This is followed downhill, becoming a surfaced road, to the A272 Petersfield Road. 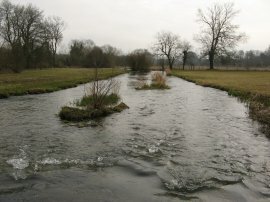 Just before the main road is reached the route crosses over one of the sources of the River Itchen, photo 3. 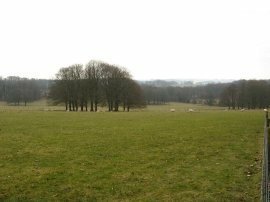 Much of the area we had been crossing over so far had formed the site of the Battle of Cheriton, which was fought on 29th March 1644, and ended up being an important Parliamentarian victory in the English Civil War. There was small information board, part of the Cheriton Battlefield Walk close to the path. Crossing the A272 the route heads up Hinton Hill to Hinton Ampner. 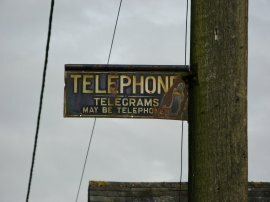 On a telegraph pole besides the road there was a very old Telegrams sign attached, photo 4, although it was hard to say if this was an original feature or just a decoration. Where the road bends round to the left the route continues ahead, passing to the right of some ornamental bushes to join a path that skirts round the side of Hinton Ampner House and Gardens before heading out across the large area of parkland to the south of the house, photo's 5 and 6, as the route heads towards Kilmeston. 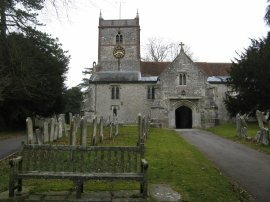 The route crosses a minor road and continues ahead, passing St Andrew's Church, photo 7. 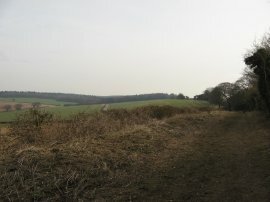 The path runs alongside a number of small fields with another fine house, Dean House, photo 8, away to the left. Reaching a road the route then heads to the right. At the end of the short stretch of the road the route enters a field and heads to the left along a field boundary. 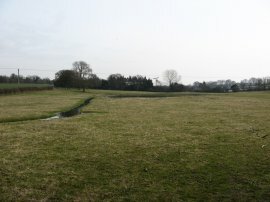 At the end of the second field on the right the route bears to the right to cross diagonally over two much larger open fields. Leaving the second of these fields the path begins heading more steeply up a grassy field as the route climbs up towards the top of the South Downs. Reaching the top of the hill the route crosses a stile to join a road where the Wayfarers Walk links up with the route of the South Downs national trail. 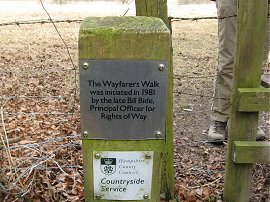 Attached to the stile was a small plaque, photo 9, commemorating the initiation of the walk. 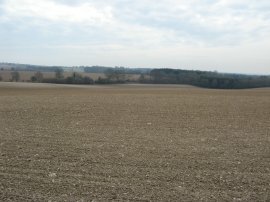 The route only follows the road for a few yards before joining a track on the left which runs across the top of the ridge, opening up views to the south across the ploughed fields, photo 10. 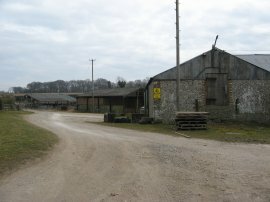 At this point the route is also shared with the Monarchs Way which is followed as far as the buildings of Lomer Farm, photo 11, where the Wayfarers Walk heads to the right along a farm track that starts heading downhill between fields. Reaching a field the route runs parallel with Rabbit Copse, heading for a gap into the next field. After crossing over a small open area the route runs along the edge some woodland before heading down to the bottom of a valley, marked as Betty Mundys Bottom on the map. 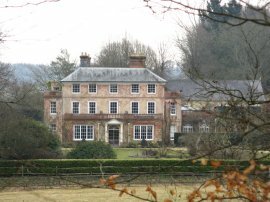 Here the footpath continues ahead to reach the grounds of a large house. On the map the path is showing as continuing ahead alongside the boundary fence of the property although efforts have been made to obscure this path and an alternative has been constructed that heads to the left away from the house. After some debate with Anne we continued ahead along the path as shown on the map running alongside the fence past a large ornamental pond before rejoining the main path at the end of the fence. 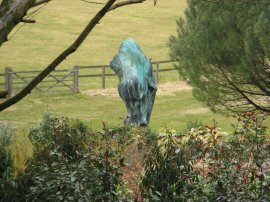 Following the footpath to the right we were able to see a large Nick Fiddian-Green horse head sculpture in the garden, photo 13. 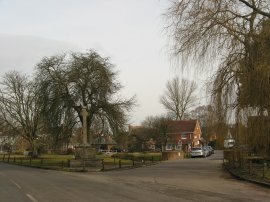 The footpath then heads to the left, crossing the middle of a field with trees on either side before heading down to the buildings of St Clair's Farm where the route heads to the left along a track to join Sailor's Lane, rather than continuing between the farm buildings as marked on the map. 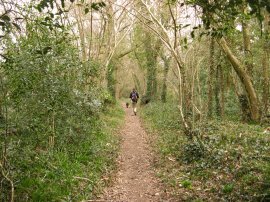 The path heads down Sailor's Lane, continuing ahead over a cross roads, before joining a path on the left that soon runs alongside the edge of Bottom Copse with fields to the right. 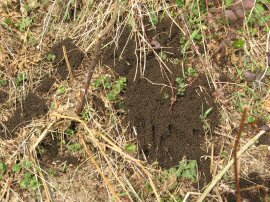 As we were walking along this path we passed a number of areas at the edge of the woodland where large swarms of ants had come out to the surface of their nests, photos 14 and 15. Reaching Steynes Farm the route heads to the right to cross over the B3035, then heading to the left to pass through some trees which runs along the edge of the Corhampton Golf Course. Reaching the end of the trees the route turns to the left to run along the edge of a fairway before following a path that bends round to the right to reach a road. Here the Wayfarers Way heads to the right to soon reach a junction of five roads. The route continues ahead at the junction heading downhill along Hacketts Lane. 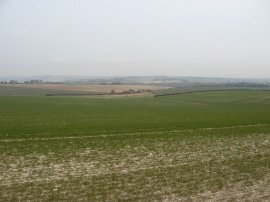 There were fine views from the cross roads, photo 16, and rather than walk along the road we walked alongside the edge of the large open field on the right. Just after Hacketts Lane bends round to the left we crossed over the road and joined a footpath on the right that heads past a clump of trees and out along a field edge path running along the edge of a hill. 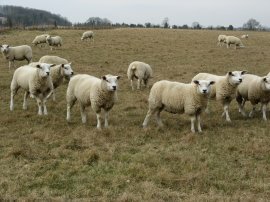 Reaching a second clump of trees the route turns to the left, heading downhill across a field to the village of Droxford, passing alongside a field of sheep, photo 17, one of only a few fields containing livestock wee saw all day. Leaving the field the route heads down Park Lane, continuing ahead at a junction, to reach the High Street. Crossing the road the Wayfarers Way heads across Droxford Square into the churchyard of St Mary & All Saints church, photo 18. 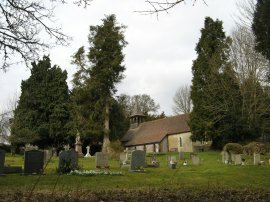 By the churchyard was another of the Wayfarers Walk distance markers, photo 19, which showed we had now walked 51 miles along the path. 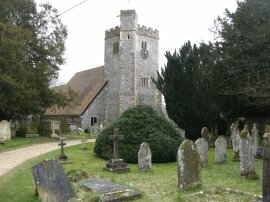 Leaving the churchyard the path heads along a field edge before crossing a bridge over the River Meon, photo 20. 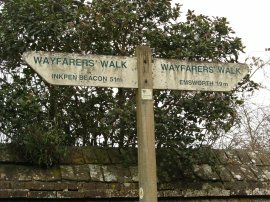 The Wayfarers Way then turns to the right along a field edge path running parallel with the River Meon. Crossing the fields the route gradually heads away from the river to run besides an old tree lined railway embankment that lines the fields on the left. At the end of the final field there was a rather boggy area of ground to cross before we joined the road at Cutts Arch. 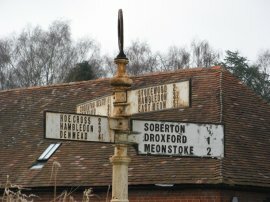 Here we followed the road round to the left as it makes its way to the village of Soberton. Reaching the car we had walked another 14.8 miles along the route and now only have about 16 miles left to the end of the walk at Emsworth. 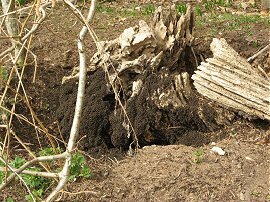 As usual I have uploaded the route of the walk which can be accessed here: Wayfarers Walk stage 4 Route.